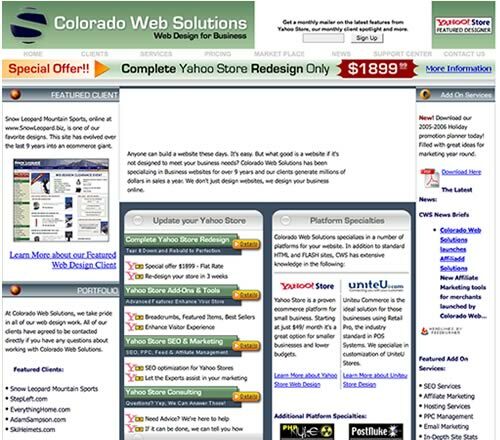 Back in 1997, Colorado Web Solutions started designing Yahoo! Stores before they were even called Yahoo! Stores. Back in 1997 the internet was still a baby. Fresh out of college, Matt Sampson decided to try to claim his stake in the world wide web. His family owned a small ski shop called The Snow Leopard in Evergreen, Colorado so he purchased the domain TheSnowLeopard.com and started building a site. One issue though, he had no experience. None. So, Matt's wife-to-be bought him a book called HTML for Dummies and Matt read it cover to cover, entranced by what could be done with simple coding. He practiced day and night and finally posted his very first version of the little ski shops website. "I was so proud of the site. It was one page, had a logo and some information about our hours and how to get to the store", says Matt. "Looking back on it, it was truly horrid", he said with a smile. Later that season, Matt realized that the site wasn't going to go anywhere without selling online. He started doing his research and found a company called ViaWeb. They offered a service for $19.99 a month that would allow you to build an online store. ViaWeb was later purchased by Yahoo! ! and became what we know today as Yahoo! Merchant Solutions. So, Matt was on a mission. Get everything he could online from the store and start selling it. The Snow Leopard's first order came a little less than a month after launch and was for $14.99. It was a carry bag for a pair of snowshoes. Matt was thrilled, and that little $14.99 sale motivated him to go all in. And he did. The Snow Leopard's Yahoo! store grew and evolved over the years to a store with over 1500 items. Matt was frustrated with Yahoo! 's standard templates so he started to explore RTML. He attended a conference about RTML in L. A. and came back to the store and re-designed the site (again). Soon, the site was pulling in 25 to 50 orders a day and Sampson was overwhelmed with the work. It was way too much work for one person to handle, so he started pulling staff off the retail floor to help him with the web business. Quickly, the website (operating out of a closet in the back) out grew it's space and the retail store was reduced in size while the web operations started taking more square footage. 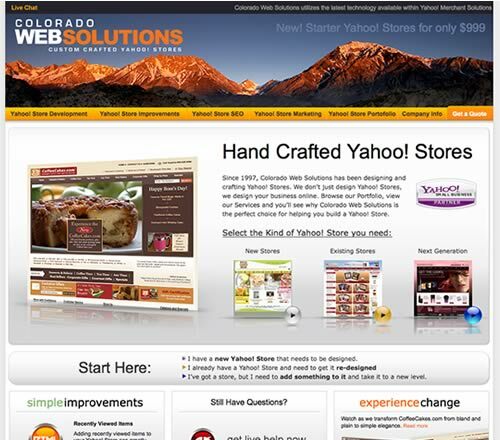 Colorado Web Solutions is born. At that point, Matt thought "This is a great opportunity for Small Businesses to get online! I wonder if I can help people start selling in their own Yahoo! Stores?" 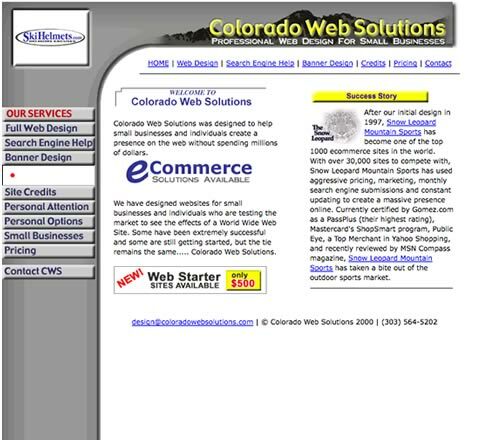 And Colorado Web Solutions was born. With no money and a little site to peddle his wares, Matt signed his first client, EverythingBagel.com. It was a small bagel shop in California that had a Yahoo! Store, but needed it to be spiced up a bit. 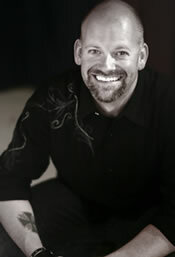 Matt worked closely with them to help and after a few weeks, the new EverythingBagel.com was launched. The company saw an immediate increase in sales after the design and started to grow. And grow... and grow... and grow. EverythingBagel.com evolved into EverythingHome.com and that's literally what they were. From a small bagel shop making a few thousand dollars from their website, they have grown into a multi-million dollar enterprise. 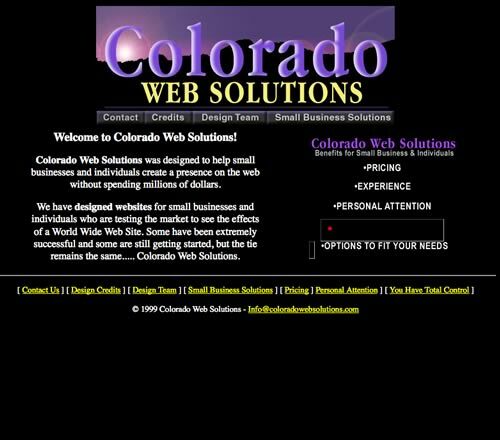 The original owner has since moved on, but owner Michael fondly looks back saying that, "It all started with Colorado Web Solutions. If Matt hadn't helped with the re-design of our site, I may have never realized what was possible. 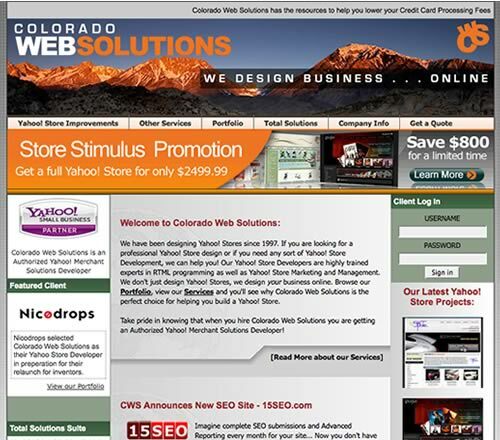 Thank you Colorado Web Solutions!" 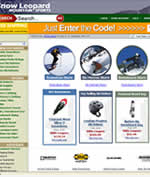 Matt continued to work with the family ski shop as well and in the spring of 2001 he realized that the website was too big to run out of a retail store. So, he and his new web team picked up and moved down to Golden, Colorado and started the web only side of the business. Business was booming and after one holiday season of receiving over 500 orders a day, Matt realized that Yahoo! Store might be too small to handle their volume. So, after months of research, he signed on with a company called UniteU. Working with UniteU, Matt launched SnowLeopard.biz. This site was integrated with their POS system and eliminated many of the inventory headaches that has started to crop up with Yahoo! . They said goodbye to their Yahoo! Store and moved on with the UniteU platform. Snow Leopard closed down in 2004. Looking back on it, Matt reflected, "UniteU is a fantastic platform for POS integrations, etc and offers a nice upscale alternative to Yahoo! Stores., but if I knew then what I know now, I would have stayed with Yahoo! Their platform is so robust and it keeps evolving. We could easily handle the business today with Yahoo! , but the technology just wasn't there when we needed it. If we'd held on just a little longer, we would have seen the work being accomplished by Yahoo! during those growing years and been able to enjoy the massively improved platform they offer today." He also adds that, "Yahoo! Store has it's limitations, but with the RTML coding that's available today, they're pretty minor in the big picture. The benefits of Yahoo! Store far outweigh the shortcomings for most small and medium businesses." After Snow Leopard closed its' doors, Matt and another Snow Leopard employee, Brent, started working full time on Colorado Web Solutions projects with the hopes to support their families. The two of them poured every ounce of energy into the company and five years later, with almost 10 times as many employees as those early days, Colorado Web Solutions is stronger than ever and growing every day. So, from a small closet in a 200 square foot retail store to offices overlooking Colorado's Front Range, Colorado Web Solutions is a true success story. "It's not about our success though, " says Matt, "We're only successful if our clients are successful. We remain steadfast and focused on the clients themselves and their businesses. We treat them like they are our own businesses. It's truly a partnership between design and business. That's where our slogan came from, 'We design Business. . . Online." 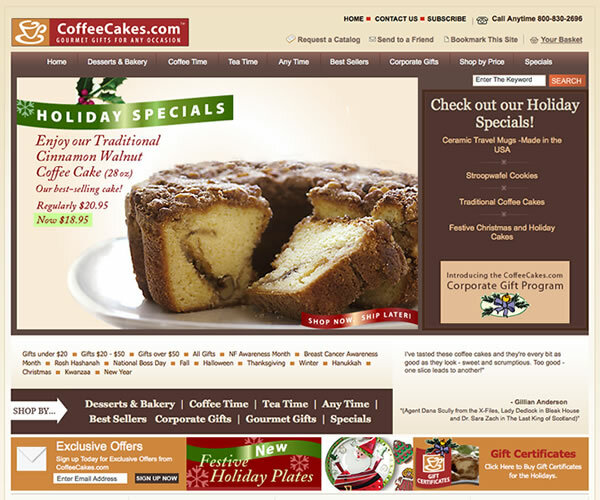 He continues with, "We don't just design website's, we design businesses. That's what makes us such a great company to work with. We understand online business. We've run a successful online business for 12 years and we can help clients avoid making the mistakes I made when starting out." "The future? ", smiles Matt, "Oh I can't wait for the future, you're not going to believe what we've got up our sleeves." Guess we'll have to wait to see what the future holds, but we can tell you this. Colorado Web Solutions is growing. We're developing new tools. We're creating new ideas. You're going to love what you'll see."